Thanks to Michael Harmon for developing this awesome review of conjunctivitis for AMR, AND agreeing to let me put it up for all to see. That is kind of the point of this blog- share some of the great ambulatory teaching that is going on throughout the residency program with everyone. If you want to be a guest poster too, it’s easy. Just shoot me an email and we’ll make it happen. Treatment: Usually self limited but treatment can decrease course. 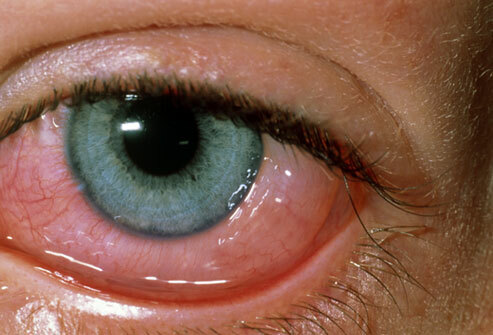 Presentation: conjunctivitis +/- viral prodrome (fever, URI symptoms). Conjunctivitis is often bilateral. Discharge is watery although may see some mucous on close exam. Often complain of burning/gritty sensation in eyes. Course: similar to that of common cold: Symptoms may worsen in first few days and take several weeks to recover. Treatment: May alleviate symptoms, doesn’t affect duration. Treat with artificial tears and topical antihistamines. Don’t give topical steroids because could cause corneal scarring, melting, perforation. Thanks, Zarjou for your answer- you are right on. A hollenhorst plaque is evidence of a cholesterol embolus in the eye. It is one finding of cholesterol crystal embolism syndrome. Simplified- a piece of cholesterol flicks off of an unstable plaque and causes trouble upstream. 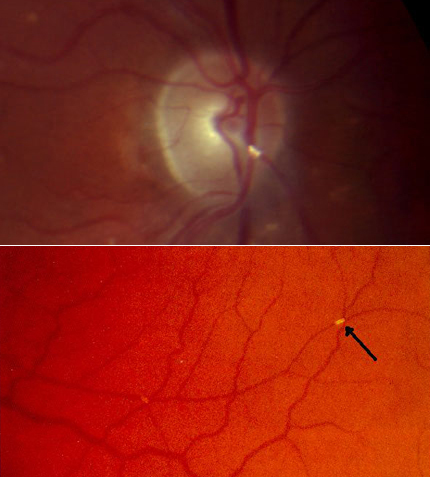 Manifestations can be seen in kidneys, skin (blue toe syndrome), GI, and CNS- including the eye, as in our patient. This can be a result of instrumentation- such has a cath or CEA, or can be spontaneous. Hollenhorst plaques tend to originate from the carotid artery, and just over half of patients are symptomatic ranging from amarosis fugax, pain, or blurred vision. Incidental discovery of a plaque, such as in our patient, happens about a third of the time, and may represent an old event, or may be significant of something serious. Certainly, if there is a sign of occlusion in other vascular beds, then you can assume something important is going on. Evaluation should include non invasive imaging of the vascular bed in question- for a Hollenhorst Plaque, look at the carotid arteries. You should treat other risk factors for vascular disease- quit smoking, control blood pressure, and diabetes. You should certainly also take a look at the lipid profile and treat aggressively. Many would say that this is a coronary risk equivalent, with concomitant lipid and blood pressure goals. Statins also may stabilize the plaque in question, with anti-inflammatory effects mentioned by Zarjou. There is not much data on anticoagulation, as this is not thrombus per say. In fact, anticoagulation with warfarin or heparin may actually increase the risk for recurrent cholesterol embolism. Anti-platelet therapy seems to be reasonable based on other coronary risk goals, but doesn’t do much to help the cholesterol embolic syndrome. Thanks for playing along- You know I love games. Expect more in the future. So this happened to me this week…. 1- What is a Hollenhorst Plaque? 2- What are these Important Implications? 3- I just saw this person last month, do I really need to see her again? What should I be doing?